Grocery Workers reached a tentative agreement on a new contract with Kroger Company and Cerberus Capital, the owners of Ralphs and Vons/Albertsons, respectively. After intense negotiations following the imposition of an August 8thdeadline by the seven locals of the United Food & Commercial Workers Union, the federal mediator helped guide the parties to a proposed contract. The previous contract covering nearly 50,000 Central and Southern California grocery workers expired nearly five months ago. 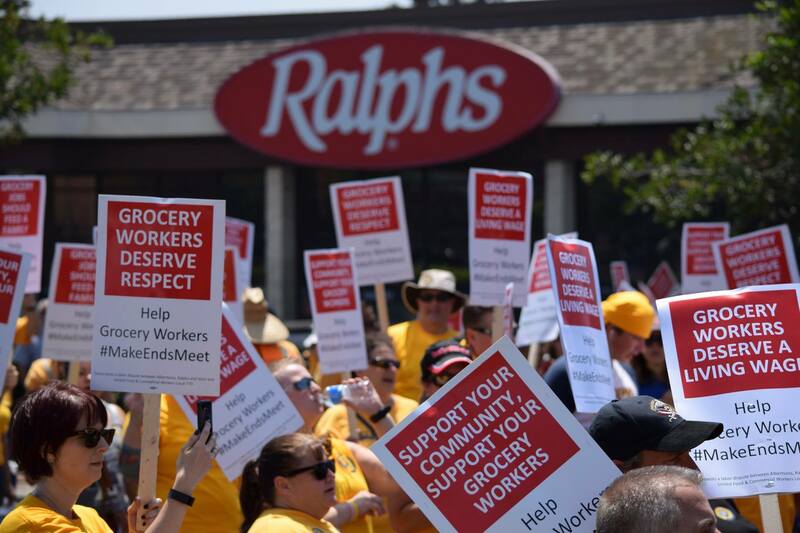 Since then, grocery workers have worked without a contract, staging numerous rallies, marches, and events designed to bring attention to their fight and to bring the corporate owners of Ralphs and Vons/Albertsons to the table. Just last Tuesday, for instance, thousands of grocery workers, community members, clergy, and fellow union members marched across Los Angeles to demand a conclusion to negotiations. Grocery workers across Central and Southern California will gather to review the details of the contract and vote on the offer. Results of the vote will be released when voting is complete by all seven UFCW Locals.